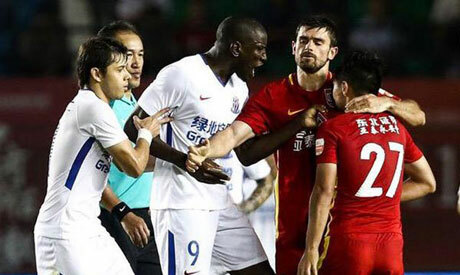 Chinese football authorities have banned Changchun Yatai midfielder Zhang Li for six games after he was found guilty of "causing chaos" during an altercation with former Chelsea striker Demba Ba in the Chinese Super League last weekend. Zhang was also fined 42,000 yuan ($6,131) after the Chinese Football Association decided the midfielder had "interfered with the order of the game and caused chaos that had a negative effect for the public" during Changchun's 1-1 draw with Ba's Shanghai Shenhua side. "According to the CFA Discipline Code, the Chinese Football Association will treat any violation of discipline and the regulations seriously to maintain good order on the field," the CFA said in a statement announcing the punishment for Zhang. "We hope everyone can join us in maintaining good order and in protecting the developing environment of Chinese football." Ba and Zhang clashed late in the second half of Saturday's meeting at Changchun Sports Center Stadium after the Senegalese upended Changchun's Tan Tiancheng and Zhang launched a verbal tirade towards the ex-Newcastle United forward. The players had to be pulled apart again less than a minute later, with Changchun's Odion Ighalo stepping in to mediate. Shenhua coach Wu Jingui claimed during the post-match news conference that Ba had been racially abused. Those allegations prompted the Chinese Football Association to announce on Monday they would be opening an investigation into the incident.